Syracuse will have to chase a national championship without starting center Fab Melo, who has been declared ineligible for the NCAA tournament. The future member of the expanded ACC announced Tuesday that the 7-foot Brazilian, who did not travel with the team to Pittsburgh for the second- and third-round games, won’t take part in the tournament due to an eligibility issue. The school did not elaborate. Melo missed three games earlier this season—including one of the top-seeded Orange’s two losses—because of an academic issue. NCAA spokesman Erik Christianson said Syracuse, not the NCAA, declared Melo ineligible. Boeheim has not decided who will start in place of Melo, the Big East Defensive Player of Year, on Thursday when the Orange (31-2) open the tournament against No. 16 seed North Carolina-Asheville. Melo’s presence on the back line of the Orange’s 2-3 zone likely won’t be a factor in that game, but it could be if Syracuse advances to play to face the winner of the Kansas State-Southern Mississippi game or possible future opponents in the East Regional such as Ohio State, Florida State or Wisconsin. The Orange are one of the deepest teams in the tournament with seven players, including Melo, averaging between 13.8 and 6.6 points per game. Melo averaged 7.8 points and 5.8 rebounds and had 88 blocks this season for Syracuse, which was ranked No. 1 for six weeks this season and finished No. 2 behind Kentucky in the final poll. The Orange opened the season with 20 straight wins before losing 67-58 at Notre Dame without Melo. 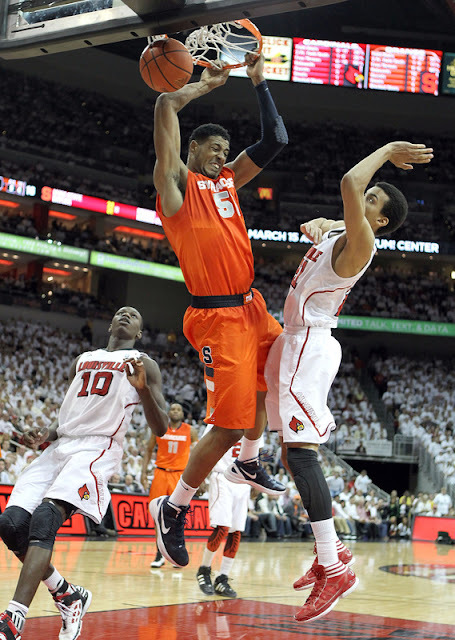 Syracuse then won 11 in a row before losing 71-68 to Cincinnati last Friday in the Big East tournament semifinals.